I *think* I may have shared this sample at the release party, but I know I haven't blogged it, so here 'tis! Drawing my inspiration from these beautiful bold dots and colors in the DP (from a StampTV kit) I used "Bring the Bling" to stamp and emboss (with black EP) these four different in the set onto Cranberry Tart cardstock, then embossed the leaves onto Fresh Asparagus and cut out for some big, layered floral embellishments! I adhered them with pop dots for extra dimension and curled the end of the leaves and some of the petals up for more depth. I love how the rich, saturated colors and *ever* so slight texture of the Pure Luxury make these almost look like felt or velvet instead of paper! 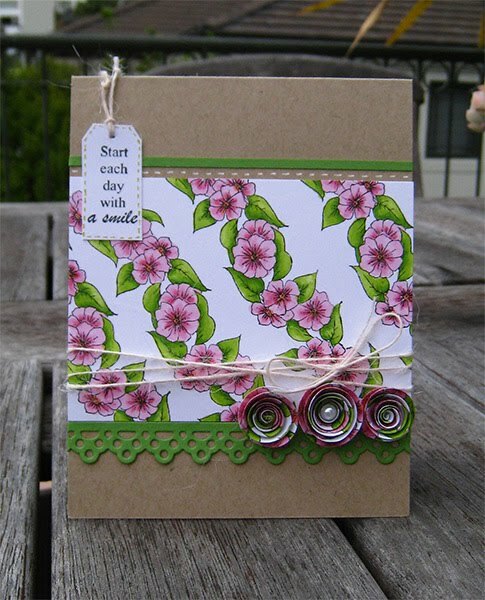 Greeting is from the new StampTV kit "Springtime Silhouettes" on a die cut circle, the pattern on the printed paper made choosing a layout and shape for my greeting easy. :) Doesn't the black just make the white extra crisp and all the other colors pop? I am lovin' this color combo! Thank you for visiting me today! It's almost the weekend! Okay, anything called a "DOODLE" is a winner in my book! I got this Sweet Deal today and it's another online goody I just had to share with you, my crafty friends! A cute little battery powered speaker you can plug your phone, ipod, whatever into and you are able to customize the face with drawings, photos etc anything /any colors you want (Lee, you could make it piiink, with bleeeng!!! ), and it's only 19 bucks! I have really been wanting to get a small speaker so the kids and I can rock out* to the tunes on my Nano together at home or in the car (never liked the one I had that had to play through my radio, too staticky!) and this totally fills the bill! You know I have to find a way to incorporate some "A Year of Flowers" in there!! 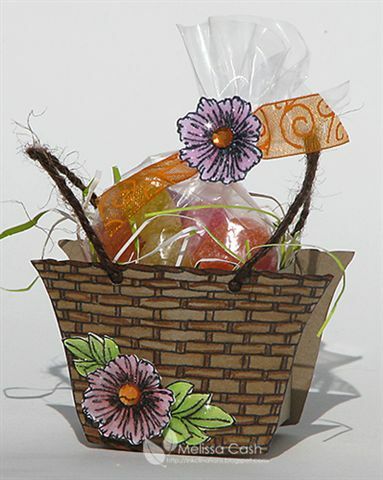 Today Melissa is blowin' my mind with the cuteness and creativity of this new 3-D project she created with "Spring Basket", take a look! Good morning! Today's project I have been meaning to make for a couple months now, inspired by a project my third grader did in Sunday school. Climbing into the car, Jonathan threw two little red scraps of paper into the cup holder. I asked what they were. "Just little cards you can give someone." I picked them up and read in his handwriting "I'm sorry", and the other said "I forgive you". Well! I just loved this idea, two "get out of jail" cards, so to speak! Here is my stampy more permanent version using "Where Your Heart Is"... And the back, I don't love my writing, so I just had to find time to print them out with my computer! The really important part is the "I FORGIVE YOU". You really ARE still in jail if you don't forgive, letting seeds of bitterness grow. And how wise it is to extend forgiveness first if you can, rather than waiting for an apology; when you do that, you choose peace. The second I finished a couple weeks ago, "Gray Matter" * by David Levy, a neurosurgeon who took a leap of faith and began praying openly for all his patients before surgery and later with his colleagues as well. It was a huge risk for him to be open about his Christian faith in this kind of setting and admit that he didn't have all the answers as a top physician and needed help to be successful in surgery. The operation descriptions were fascinating (did you know now they most often enter the brain though your THIGH and use springs and GLUE to fix aneurysms?) and the numerous accounts of how not only surgeries were successful but how those prayers transformed people's lives (the patient, their families, and hospital workers) are uplifting and a testimony to the power of prayer. He also discusses many patients who would not have benefited from surgery yet had chronic or life long health troubles to whom he gently suggested perhaps there were people in their pasts or present who needed to be forgiven, citing how many health issues and pain are related to the kind of stress that is the result of a broken heart. One line that stood out to me was this: "Bitterness is like drinking poison and hoping someone else will die." Whoa! (he says this to the reader, not the patient) Through prayer he was able to help these patients forgive as well as seek forgiveness for their own sins and receive Christ as their savior. Miraculous changes occurred immediately in both their attitudes and health through these simple acts of unloading those burdens, like removing great weight both physically and spiritually. Many parts moved me to tears, and, not surprisingly all these experiences completely transformed and blessed Dr. Levy's life and work as well. I pray this message touches your spirit today and puts someone on your heart you can forgive or may need a little help forgiving you or someone else! God bless! Good morning and happy Monday! Today the Gina K Designs team is doing another thank you blog hop for Spellbinders, sharing more samples of cards we've made with our Grand Calibur gifts! If you are following the hop you should be arriving from Lee Murphy's blog, but you may start anywhere along the way and see everything, thank you for stopping here! The card I made for today, which also uses this week's StampTV's sketch challenge, uses 5 different Spellbinders dies and I was able to cut them ALL in one pass on my Grand Calibur, then flip and emboss all five on the second pass, love it! I stamped my daisy bunch from "Spring Basket" in Vivid Coffee Bean on the Long Rectangle panel and then framed it on Long Scalloped Rectangles die cuts from Pure Luxury Creme de Menthe and Chocolate Brown. After coloring my daisies with Copics G21, YG11, RV00, BV31, BV00, and V17, I layered these over a Petite Scalloped Circle from Lovely Lavender mat, both stamped with my "Bring the Bling" flourishes in Versamark, which I then covered with Liquid Pearls. Base and Fancy Tag are made with the new Gina K Pure Luxury Wild Lilac. Greeting is from the new Free with Three set "Stenciled Spring". I hope you can participate in our sketch challenge this week!! Be sure to upload your card using this sketch to the STV gallery with the tag STVSKSP19, good luck winning a set of free stamps! Now please continue the hop on Sharon Harnist's blog and check out more stunning samples with Spellbinders along the way from the rest of our talented Gina K Designs team! Enjoy the rest of your day and I hope to see you again tomorrow! Thank you to those who particpated in Friday's blog candy drawing, this contest is now closed! Beautiful samples!!! LOVE your new sets! OMG, don't know which i like better. I always loved all your floral sets so if I have to pickone I'd go with the Spring Basket. But I can see how awesome the two can go together! EEKK! Thanks for a chance to win. Happy Friday! I have the pleasure of sharing two beautiful cards with you today from my designing friend, Melissa Bove! Melissa has such a beautiful, shabby style and a love for detial, and I am LOVING these wonderfully feminine samples she's created with Spring Basket" and "Basket Blessings"! Check out the beautiful prints on this bunny card, they are all so delicate and muted, work perfectly together. The deep pink ink she chose to stamp the basket liner really makes that part pop! She also arranged several of the single tulips around, stamping each in pastel colors and filling with coordinating inks and touch of glitter is such a beautiful look! This next sample which uses one of the flower borders from "Spring Basket" and a greeting from "Basket Blessings" has a wonderful vintage style, these flowers are a great element to add collage style to vintage papers. Such a romantic feel again, with all the distressing, lace, etc! I hope you were inspired by Melissa's creations today, I definitely was! Thank you Melissa for sharing your talents and thank YOU everyone who is purchasing these sets, they are HOT sellers right now and I am so glad you're enjoying them as much I'd hoped you would. Please see Melissa's blog for more details about these cards and leave her some love! Let's have some candy today, shall we?? Please leave me a comment below telling me which of these two sets is your favorite and/or a special idea you have for either set! If you've posted any samples on your blog or an online gallery, you can leave a link to it, we'd love to see! Subscribers and followers can leave a second comment for an extra chance to win! Sign up today if you have not already! 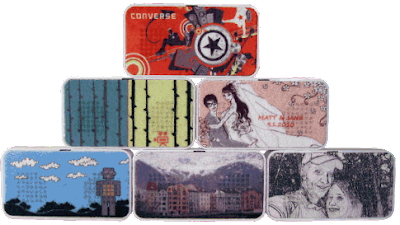 Tomorrow I will draw two names to win one of these coordinating sets! Thanks for stopping by! Inspiration Hop Day 4: StampTV Kit "Springtime Silhouettes"
I'm not sure if I've ever put these colors together before, but Emily Giovanni's new 's Grunge Damask quarter sheet in this shade of peach really spoke to me, and is so unexpected with the red and black, which is sometimes the best way to create an impact! The grunginess and texture in the patterned flourish I thought would be gorgeous with the "Bring the Bling" flourish (quickly becoming one of my favorite stamps! )and the distressed beauty of the butterfly image. I stamped it in Vivid Brick on Pure Luxury Ivory and then cut it out and bent the wings for dimension. I embossed three little bling dots on each wing to tie in the embossed trail and have the black details bounce around the card. Here's a close up to show you all the details and script in the butterfly and a bit of the shine on the black embossing. Sentiment is also from the kit and stamped directly onto the DP. Enjoy hopping around for more inspiration with this new STV Kit, I'm confident you'll agree it is the most beautiful one yet! I know I will be creating LOTS more samples with the other images very soon and I hope you will come back to see what I make! Inspiration Hop Day 3, "Perfect Pennants", Cute as a Bug", and "Lovely Labels 3"
Welcome to Day 3 of our Gina K Designs Inspiration Hop for our March sets! first set we are sharing today is Nina Brackett's "Lovely Labels 3". I stamped this label and greeting with Vintage Photo Distressing Ink on Pure Luxury Ivory CS. I made the background paper which I think goes very well with these vintage style labels using "Bring the Bling" and distressing inks, let me show you how to create this look with the emboss resist technique! First ink up the large flourish in both Antique Linen and then Vintage Photo rolled on the edges and stamp into both corners of your ivory mat. Clean your stamp and ink the flourish up again in Versamark and stamps again in both corners, offset from the first flourishes so they branch out the opposite way, but will still have some overlap. As you can see, I left a teensy bit of the dark ink on my Versamarked flourish. That's okay. Gives it a nice patina! Add clear embossing powder and heat. Now take your jumbo sponge dauber and sponge Antique Linen and Vintage Photo over your embossed araeas to distress the and make your embossing pop. Leave some light areas, you can always add more ink but can't take it away! Isn't that two tone effect with the bling gorgeous? Here it is matted on another layer of Ivory and Chocolate Brown base with the label popped up over it. I don't have the dies that match this set, so I just free cut with scissors following the edge of the label. I love the shape of this label stamp and the accent details inside it! Next we have Rupa Shevde's "Cute as a Bug". I love bees! This little guy holding the honey dipper and the sentiment are too sweet! I colored and cut out the bee and then popped him up over this flourish from "Bring the Bling" embossed in Black. Embossing the hearts in back on Red Hot CS to pop over over the flourish and next to the hive were the perfect pops of color and finishing touches! The solid color of the cardstock almost looks like little felt accents when embossed! Next up we have Tami Mayberry's "Perfect Pennants". I tried to go a little out of the box with it here. Since there are so many things you can make out of triangle shapes, one of the first that came to mind was to make a large scale tiara, fit for a queen (or little princess!) on her special day! I began by embossing the scalloped "Bring the Bling" border to give it some structure that I stamped in a curve, checking first that the three large triangles would fit across it by laying out the rubber images on top of each other before I started, perfect fit! After embossing and cutting out the large embossed triangles, I stamped out 5 more tiny harlequin patterned ones and embossed some of the hearts and stars from the set as toppers above them before cutting them out and popping them up. Please go check out the rest of our teams blogs for more inspiration with these three great sets! Inspiration Hop, Day 2: "Bring the Bling", "Warm with Love", "Make a Splash"! Welcome to Day 2 of our Gina K Designs March Inspiration hop, I hope you had a fantastic weekend (and that your new stamps will be arriving any day now LOL!) We have three sets to show today, the first is my "Bring the Bling" set. No need to keep buying more packs of adhesive pearl or rhinestone embellishments and then hoarding your favorites, this set does all that and so much MORE! (You can scroll down to see yesterday's post for my tip sheet on the many ways you can use this bling.) I shared several samples with it at the release party, but wanted to show you a very different look today from what I'd shown previously. I was glad Gina mentioned piercing in her release party video, this card uses piercing, faux stitching AND embossing, the result I think looks like I stitched clear sequins onto my mat! Let me show you what I did. Next, put a mouse pad under it and pierce into the highlight in the center of each dot. It's okay if it's not exact, but having that little circle inside really takes out a LOT of guesswork and makes the piercing go MUCH faster ! 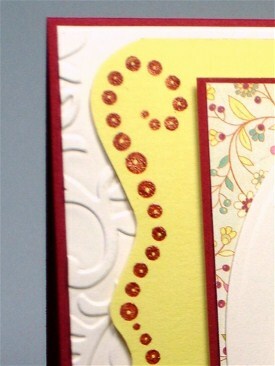 Hope this card makes you see beyond the sparkly bling possibilities for this set! It's quickly becoming one of my favorites I've released! The next set we are sharing today is Theresa Momber's "Warm with Love", filled with illustrations and sentiments in Theresa's signature style you know and love! Who can resist a beautiful swan? A picture of grace and serenity.... I know you'll see lots of beautiful stamped and sponged scenes today, so I decided to play with color and the new StampTV kit papers for a more whimsical look. Cardstock is Pure Luxury White, Lovely Lavender and Black Onyx, also found in the kit. I shaded the swan with BV31 and BV23 to blend with the lavenders in my papers and floral prints and popped it up over the sponged circle. 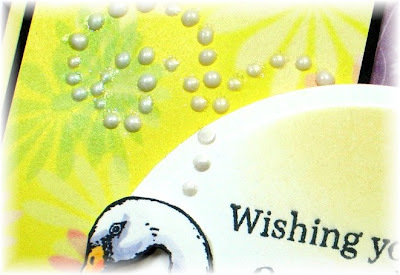 I stamped my small "Bring the Bling" flourish above and below the die cut and then dropped Liquid Pearls over the center of each dot. Allow several minutes for the card to dry FLAT to avoid smearing. Don't they look like real, tiny pearls? I also added some tiny adhesive flowers to finish the project. Love how this project turned out! Next up we have the fun "Make a Splash" from Asela Hopkins. Kids will love these silly sea creatures! I stamped the octopus twice onto more paper from the STV kit and carefully cut them out, cutting around the heads and in between tentacles just enough so they wouldn't come apart but allowed me to bend some parts forward and push other back to make the more dimensional. Add shadows to the tentacles and a kissy face and rouge to Ms. Octopus with markers! I used a piece of Basic Grey DP for the sea that had a lot of distressing and variation in the turquoise to make the ocean and then stamped two rows of my "Bring the Bling" scallops at the top, one embossed with Seafoam White, the other with Silver. Cut around the top edge to create the scalloped border and reveal a bit more of the Lemon Drop base. What did one octopus say to the other octopus? "I wanna hold your hand, hand, hand, hand, hand, hand, hand, hand." Now please go check out more samples from our talented Gina K Designs team! Thanks for joining us! Hope it inspired! :) More samples and ideas tomorrow, see you again soon! ..."A Year of Borders" basket! Kary Lim has another lovely project or us using the "A Year of Borders", this time, she stamped the butterflies border on the diagonal to create a sheet of paper she could make her 3-D project from, isn't it darling? I love the little label accent she made and then check out the sides and top! "The basket was made from 8.25x8.25" of paper. I stamped the butterflies all around the sides of the basket and coloured them with copics BG10 and YG03. Added a little Diamond stickles on the butterfly images. The little bows were made from the stamped papers with the flower borders from yesterday. I didn't have any Easter eggs (which I think would be perfect) so I filled them with my fave chocolates." Thank you Kary for working your magic again with this set and showing us how you can take a handful of yummy chocolates to another level and create a handmade gift that has people saying "Wow"! 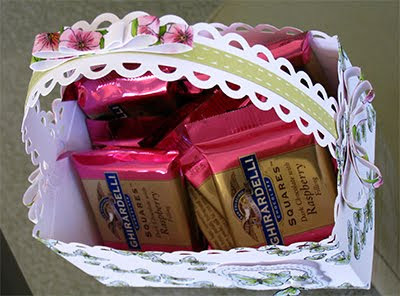 How adorable would this little basket be to store other things in when the Ghiradelli is gone? (I know I couldn't throw it away!) 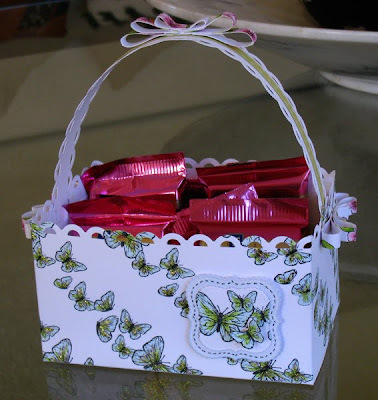 Kary made another beautiful project using the butterflies on a card, using the SCRAPS from this project, please check it out here! Hope you had a GREAT time at the party on STV last night and fun shopping in the store, all new products are AVAILABLE NOW! We're kicking off four more days of hop with the Gina K Designs Team to show you more ideas and inspiration for all our latest Gina K sets! We know the first thing a lot of people want to know is "what's free?!" and this month we have not one but TWO great freebie sets with purchase, in honor of 2 great years of StampTV! We also know have a lot in your cart and on your wish list so we want to show you some rewards you get with your orders and fun ways to use them! :) Without further adieu, let's see these sets! The first is "Stencilled Silhouettes", bold images that are beautiful with the Direct to Stamp technique, get out your markers! :) This set is free this month only with the purchase of three stamps sets valued at 19.95 or above! Today I made two very simple CAS cards, these stamps make such crisps pop of color on a clean white sheet of Pure Luxury! The next card I made the row going across my vertical card with the greeting below it. This is such a classic layout! I started by stamping my scalloped row from "Bring the Bling" then stamped each trio of inked up flowers above it TWICE, the flowers fit perfectly at the top of each "v", I was so excited to discover that when Gina previewed the set! You could also stamp the scallops upside down and then stamp the flowers into the "humps". Lemon Drop layer is stamped with my "Bring the Bling" border, I tapped the stamp onto my Versamark pad before inking it up with cranberry ink, and then stamping. This layer of Versamark allows clear EP to stick to the image so after heating you can have glossy, dimensional embossing, just like real bling! (Be sure to do the Versamark FIRST so you don't get colored ink on your pad! ) I used the stamped border as a guide to free cut around it creating a fancy edge. I love how these little bling dots look with the berries in the print! I also stamped a little bling flower onto the same DP and then just cut around the edge to make an embellishment. Ivory CS is Cuttlebugged with Victoria and base is Pure Luxury Lipstick Red. Both sets here at "What's New?"! Please enjoy more inspiration with these stamps from our talented Gina K Design Team! The party is tonight at StampTV, 7-9 PM CST! Oh how I have missed sharing peeks this week, but you can expect lots of samples starting tonight and continuing through next week! here is a tiny snippet of a card made for tonight, using two new sets! So what stamp is mine?? (hint, not the greeting, not the swan!) I am SO excited to share my latest set with you and all it can do, so many techniques, fun products to go with, it will be a "go to" set that stays out on your desk and will have all your cards dressed to impress and stepping out in style! Something ELSE new for the party tonight, more videos of Gina and the new stamps in action, (I am pins and needles to see!) so this party we are having for our 2 year Stamp TV anniversary is sure to be a night to remember! It's shorter party but action packed so I really hope you can peek in! Store opens one hour earlier for shopping! Kary Lim!!! I KNOW you remember her gorgeous work with "A Year of Borders" at the beginning of wnter and I made sure before her "reign" ended she'd be coming back with some seasonal samples for us throughout the year! Spring is upon us, I am enjoying a fun and busy Spring Break with my boys and SUPER BUSY getting ready for our release party on Thursday!! * So it is a real blessing to have her beautiful work today since I can't share anything I am working on for a few more days, AND I have not gotten to play with "A Year of Borders" in a few months, so this is a treat for me too! Talk about inspiration, this card is like a breath of fresh (Spring!) air! "I wanted to show how pretty the border flowers are, and how one can use it to make your own pattern paper. I cut a strip of white cardstock 3 inch wide, and stamped the flowers diagonally. Then I did some colouring with copics ( I used R81, R83 & R85 for the flowers and YR02 for the flower centre, & YG03 & YG17 for the leaves). The 3 rolled flowers are also made from the stamped piece of paper. " Here is a card I made with one of the Fancy Tag Dies. These beautiful tags are often the inspiration for the entire card, the elegant flourished and intricate details make it easy choose paper and images to create a gorgeous, coordinated project and really add flair to any sentiment! I embossed a greeting from "Basket Blessings" in gold into the center of the die and then rubbed some metallic paste over the die before removing it, I love using these dies like stencils, just makes the beautiful details in the embossed edges pop even more. I embossed my bunch of tulips and lilies from "Spring Basket", stamping one on ivory cardstock then flipping the stamp over to stamp below and create this rounded, wreath effect. Cut out and mounted under the tag die cut, it looks like a beautiful medallion, I love the way the flower bunches frame the sentiment. As I've said before, the thing I love most about the Grand Calibur is having the ability to cut and emboss so many images at once on the large plate, but I also love how evenly it applies pressure, so that even when you are doing one die like this Fancy Tag, it easily cuts out all those tiny details in just one pass. Thank you again, Spellbinders for the Grand Calibur! For someone like me who is a constant collector of Nestabilities, this machine and streamlines the cardmaking process and gets me using all these beautiful dies more often! Love it! 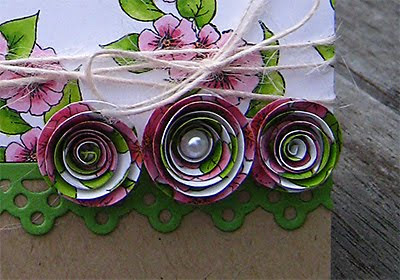 Time to continue the hop, please check out another project using Spellbinders at Michelle's blog!